It’s been about six months since specialty shops selling recreational marijuana began operating legally in Colorado. In July, the first batch of shops licensed to sell retail weed will open in Washington State. Both states prohibit locally-purchased pot from crossing state lines and marijuana remains illegal under the federal laws that also govern the aviation industry. So as the busy summer travel season begins, we checked in with the TSA and some of the airports in the pot-pioneering states to see how they’re enforcing – or plan to enforce – rules prohibiting passengers from taking pot on a plane. In an effort to keep travelers from trying, even inadvertently, to take pot through security checkpoints, airports in Colorado have instituted a variety of measures. In January, Denver International instituted a policy that bans marijuana anywhere on airport property, including pre-security areas where having small amounts of pot would otherwise be allowed. Signs announcing the rules are posted and remind travelers that the airport can impose fines of up to $999. Word seems to have gotten out: Since the beginning of the year, only ten passengers have been found to have small amounts of marijuana on them at the TSA checkpoints. “The Denver Police Department was called for each person and they all voluntarily complied with our rules by throwing [the pot] away before flying,” said airport spokesman Heath Montgomery. “We established our rules early and worked to educate people about our expectations. That seems to be an effective combination,” he said. Other airports in Colorado are reporting much of the same. 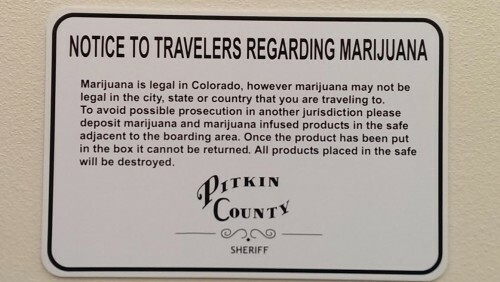 At the Colorado Springs Airport, the local police department installed an amnesty box and as well as signs alerting passengers to the laws governing traveling across state lines with marijuana. In cooperation with its local sheriff’s department, in January the Aspen/Pitkin County Airport set up signs and an amnesty box as well. “We haven’t really noticed too much of an issue,” said Brian Grefe, the airport’s assistant aviation director of administration, only that many images of its amnesty box have been showing up online. “It’s been one of our biggest social media hits,” said Grefe. As Washington State gets ready for its first licensed recreational pot shops to open, “the best lesson it can take from Colorado is that while it is illegal to transport marijuana out of the state, people are still going to inadvertently show up with it at the airport,” said Jeff Price an aviation and security expert and an a professor at the Metropolitan State University of Denver. Price suggests airports in Washington take the approach Denver International adopted, “which is to ban it in the airport but then not prosecute people if they are caught with it – just send them back to their cars or confiscate and dispose of it properly,” or to follow the lead of other airports that have set up pot amnesty boxes at TSA checkpoints. So far, that’s not what airports in Washington State seem to be planning. Officials at Seattle-Tacoma International Airport say there are no plans to install amnesty boxes and no plans to change any airport procedures due to the opening of retail pot stores. “I suppose a passenger could throw their pot in the garbage if they’d like,” said airport spokesman Perry Cooper. There are no plans to change procedures at the Spokane International Airport either. There, airport police officers who currently encounter travelers with small amounts of medical marijuana “advise them of the option to surrender it to the airport police who can legally destroy it,” said airport spokesman Todd Woodard.